Home Equipment Best Pool Filter to Buy: 2018 Definitive Guide! Searching for the best pool filter that will solve all your swimming needs? Then you have clicked on the right guide. The market is filled with cutting-edge swimming pool filtering systems, where one is as attractive as the next. And we understand if you’re having difficulty in choosing the one that will fit you the best. So, with your needs in mind, we have done some extensive research and filter test trials to bring you some of the best the pool treatment field has to offer. The filters we have chosen for you today are not only some the finest pool cleaning equipment but our personal favorites as well. And to help with your decision, even more, we have also gone over the types of filters that are currently available, their distinctive features, advantages, and disadvantages. So sit back and enjoy our guide on the Best Pool Filter. How to Choose the Right Size Pool Filter. 1. Intex Krystal Clear Sand Filter Pump for Above Ground Pools. 2. 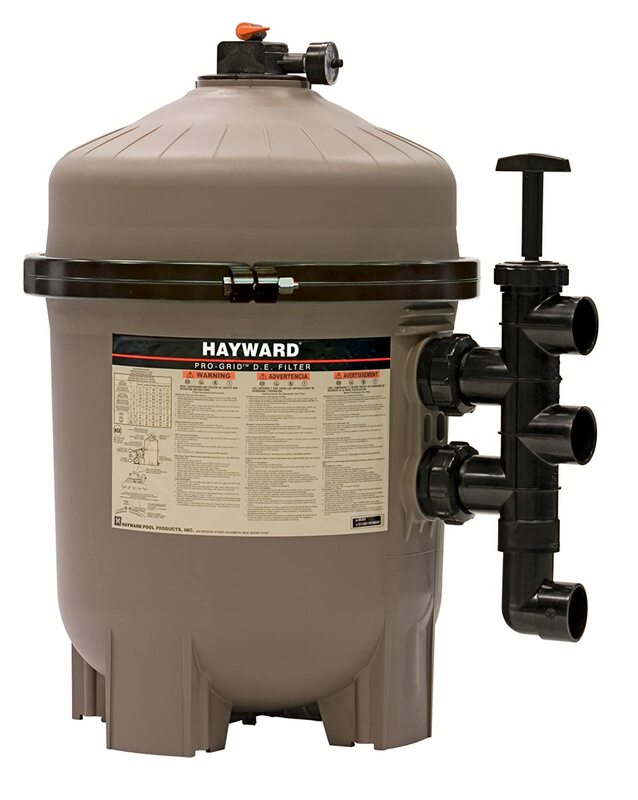 Hayward ProSeries S220T Sand Filter. 3. 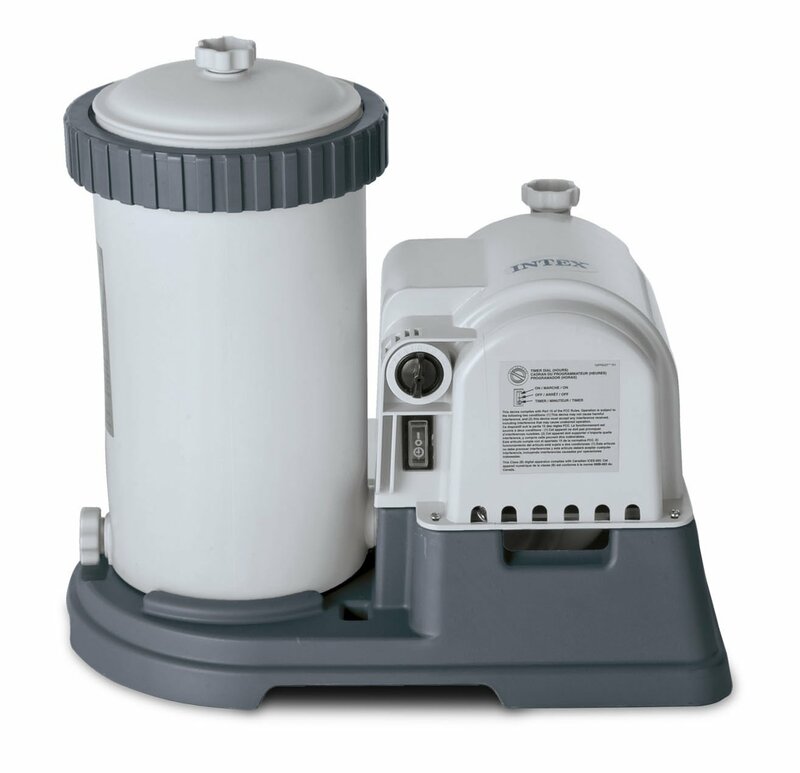 Intex 28675EG Krystal Clear 1500 GPH Sand Filter Pump & Saltwater System. 4. 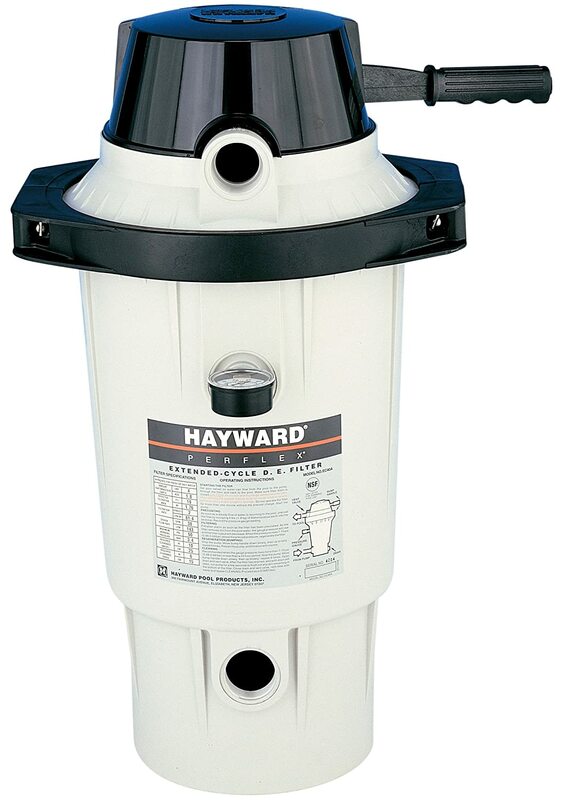 Hayward S210T ProSeries Sand Filter, 20-Inch, Top-Mount. 5. Sand Master Soft Sided Above Ground Pool Sand Filter System. As there are 3 primary classes of pool filters, and each with their own set of attractive features; it is difficult to choose the one that will fit you the best. So, today we have taken the liberty of listing all 3 types in great detail. Just as the name suggests, the conventional sand filter uses no. 20 silica sand that is specially graded to trap unwanted dust particles and debris. Sand as a filtration agent is capable of sieving out particles as small as 20 microns and debris almost as big as 100 microns. The sand swimming pool filters are one of the most economical and easy to maintain pool hardware in today’s market. With an average cost of $248-$1,135, it is quite easily affordable for any homeowner. The whole system can be easily installed and replaced. Sand filter and alternative filter media are cheap. Not as efficient as cartridge and DE filters. We felt that the sand filtration system could be the right choice for those whose pools are a frequent victim to larger debris particles like fallen leaves and insects. And compared to other pool filters, this one is easy to maintain. It has a convenient backwash feature that reverses the water through the screen and flushes out the system. The cartridge filter has one of the more traditional working methods than the other classes. Made of polyester fibers which surround a plastic core, the water is caused to flow through its pleats, which incidentally traps all the debris as small as 10 microns, and the clean water is then dispensed back into the pool. The pool cartridge filter is, by all means, an entry level pool treatment hardware. And at a price range of at a price range of $199-$1,164 it is the cheapest pool filter on our list today. Most economical pool filtration system. Traps debris particles as small as 10 microns. Doesn’t waste too much water. Pool filter cartridges are inexpensive and affordable and can be readily replaced. Filter cartridges need to be changed often. The filtration pump is not powerful enough to cater to larger pools. If you have a rather small pool, or a deckside spa and hot tub, then the cartridge pool filters will be your best choice. Though it needs more maintenance than sand filters, the cartridges are incredibly easy to clean and even easier to replace. The D.E filters are the best in modern pool treatment. The filtering agent is essentially a powder, made of microscopic diatoms. This powder is added at the skimmer which has grids inside covered with a nylon fabric. The dissolved powder sticks to the fabric and traps debris as small as 3-5 microns. The most expensive category of pool filters. The D.E filters are costly to purchase and difficult to maintain and stand at an average price range of $490-$1,500. The most effective pool cleaning option. Catches particles as small as 3-5 microns. Convenient to add, with the help of the skimmer. Has a ‘water polish’ feature that makes your pool look transparent. The most expensive filter category. D.E Powder is carcinogenic in its raw form. Irrespective of the size of your pool, the D.E filter can effortlessly be the most effective way of keeping your pool clean. And, if you can look past the initial cost and the higher maintenance charges, then it indeed is the best pool cleaning option. You’re probably asking yourself, “What size pool filter do I need?” Well, we believe that the size of the filter you buy should reflect the size of the pool you own. To start off, determine the volume of your pool, which should include length, width, and depth, or radius for a circular structure. Then divide the pool capacity in terms of gallons, and further divide the gallon flow you get per hour (it should be a minimum of 12) by 60 to determine the gallons you get per minute. The final figure you get from this is the core numeric your filter should fulfill. The water filter system should match or exceed the calculated gallon flow per minute. A lot of the modern day above ground pools come as an entire unit, complete with their own water filtration system. If you ever wish to purchase an above ground pool, make sure you inquire as to the type of water filter it comes equipped with. A sufficient level of water flow and cleaning power is necessary for an above ground pool; hence they mainly come with either a sand or cartridge filter. The cartridge filter is by far the most popular choice as it comes with a ‘pump2’ that generates a 1 HP filtration force. A force lower than this will not adequately clean the pool, and an effect stronger than 1 HP will damage the vinyl3 of your pool. The in-ground pools are the most versatile when it comes to matching itself with a pool filter system. They are compatible with any type of filtration system you wish to install it with; hence the D.E filter is the most efficient choice for the in-ground pool. The cartridge filter can be a convenient choice as well if you’re looking for a more affordable option. They are comfortable to maintain and clean and comes with readily replaceable parts. 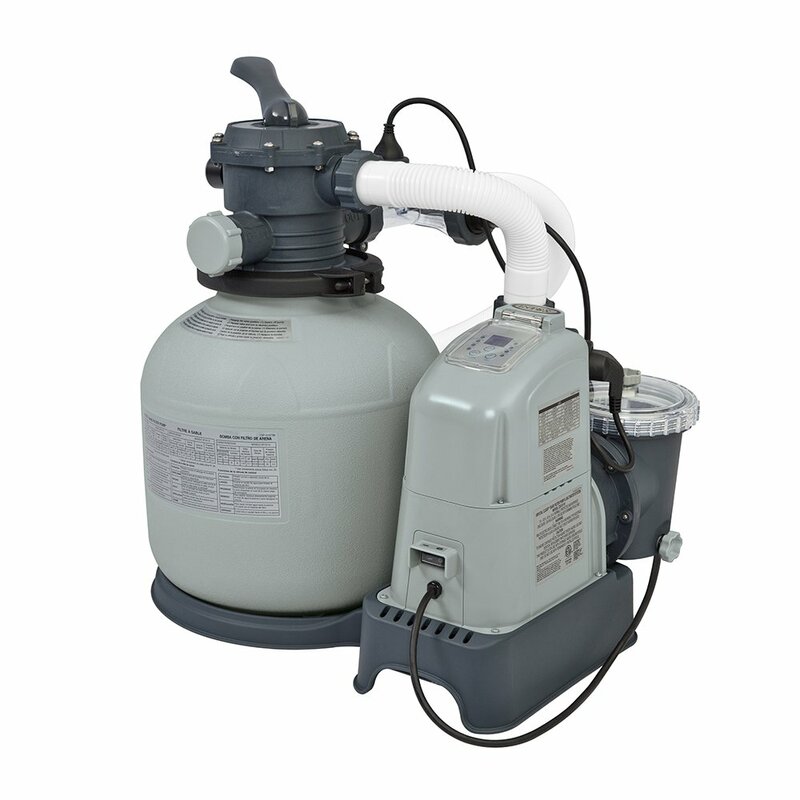 The sand filter is also a popular choice, but it is the least efficient. So, when it comes to choosing an in-ground pool filter system, the D.E is by far the best option which in the long run can solve a lot of water-related issues. The saltwater pools too are as flexible as the in-ground ones. But the sand filters are much more popular with this type of pools due to their higher durability (of around 7 years) and the cost of maintenance being as cheap as $100. The salt water filtration system is all about being pocket-friendly and economical. You can opt for the cartridge filter as well, but their maintenance cost is rather high as the filter cartridges need to be changed frequently. The D.E filter can overall provide the most efficient cleaning, but for a saltwater pool, its initial expense is too high. Additionally, the higher maintenance it demands is pretty inconvenient for the average homeowner. To help you out with your choices we have handpicked some of our personal favorites. 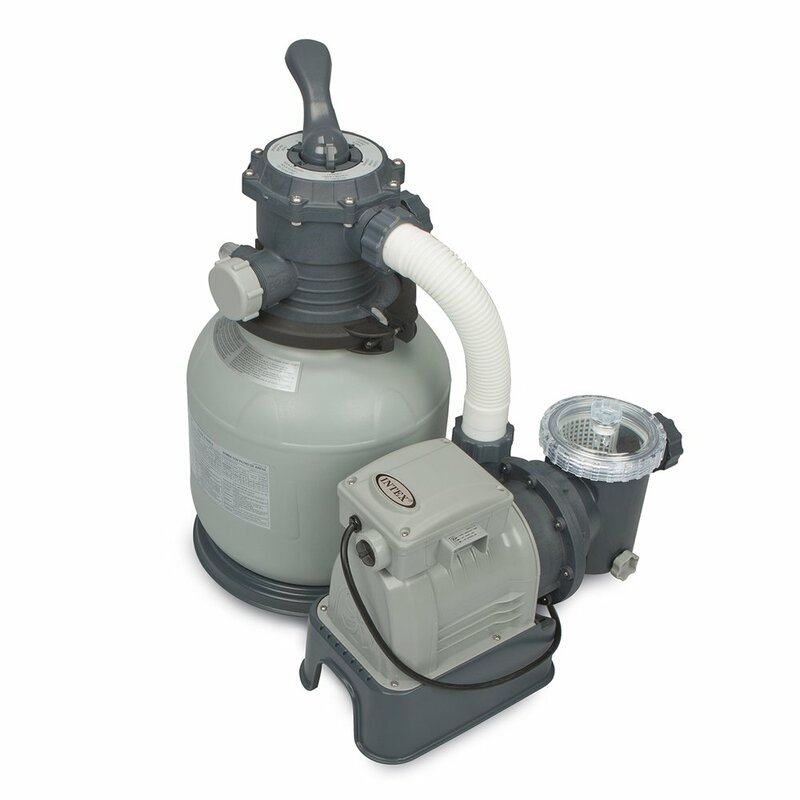 When it comes to the field of entry-level sand filters, the Intex series of Krystal Clear Sand Filter Pump is perhaps the most popular choice. And the secret to their tremendous appeal lie mainly with the multi-functional control valve built into them. When trying out the Krystal Clear series, the control valve provided us with much of the user satisfaction that other entry level filters fail to deliver. The valve allowed us complete control over its processes of filtration, backwash, rinse, recirculation, drainage and system shutdown. And along with the 24-hour timer, the filters were able to give us a fantastic pool cleaning experience. This filtration series comes with tank sizes of 10-inch, 12-inch, 14-inch, and 16-inch, where the 10-inch model has a system flow rate of 1050 gallons per hour, and the 16-inch provides 2450 gallons per hour. 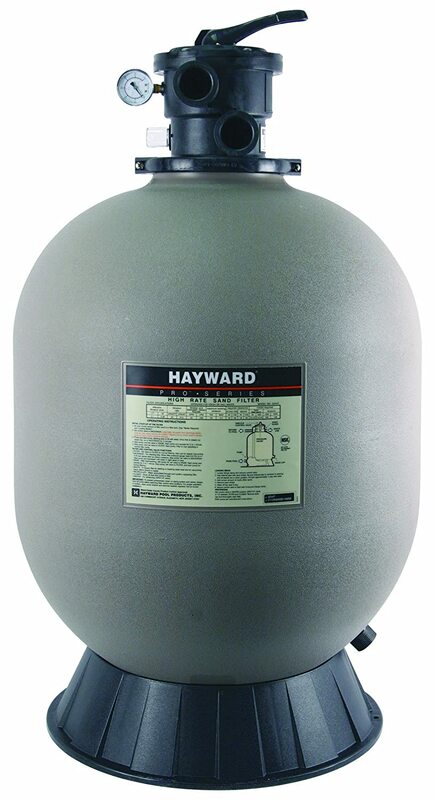 The Hayward ProSeries Sand Filter is the most durable and corrosion resistant sand filter model on our list today. It comes with cutting-edge self-cleaning laterals that make for one of the smoothest water filtration processes. Even while backwashing, the filter can clean its sand sieve with ease, thereby substantially limiting the cost of maintenance and replacement. But what attracted us most about the ProSeries is how it has two types of sand mounts built into it. The top-mount and side-mount sand filters work together to create an umbrella-fold that immensely facilitate the self-filtration process. Thereby improving the water flow, and redistributing it for more balanced backwashing. The S220T come in dimension heights of 22”, 24”, 27”.Apart from the difference in pump and system flow rate, the primary feature that sets them apart is the valve they use. As some sizes use the vari-flo valve, the others use a side valve. Intex’s 2867EG model is the latest addition to their Krystal Clear series, but with its own special twist. What sets it apart from its predecessors is its specially built in saltwater system that comes with E.C.O or electrocatalytic oxidation. Saltwater systems that have E.C.O are famous for their ability in balancing the amount of chlorine in the pool water. This not only keeps the pool water clean and safe but also reduces a lot of the harshness that excessive chlorine brings to your pool. Unlike the other substandard sand filters in the market, the 2867EG manages to catch floating algae along with the larger debris particles. As it comes in two variants of 1500 GPH and 2150 GPH, the filter has a maximum of 15,000-gallon water capacity and a 2150-gallon system flow rate. Making it a perfect fit for small to mid-sized pools and hot tubs. The Hayward S210T is a bit different from the rest of the models in the ProSeries when it comes to the mounted filters. Instead of having a dual top and side-mount filter to create an umbrella-fold, the S210T has a single high-performance top-mount that makes it ideal for small in-ground pools and aquariums. As durable as it gets, the S210T has a fantastic corrosion-proof filter tank that can weather the elements with ease. All its 14”, 16”, 18” and 20” size variants, have 7-position vari-flo valve that will be able to give you the optimal water flow even at lower pressure drops. It even has a large pressure sand/water drain that rapidly winterizes the water flow every filtration cycle. Additionally, the integral top diffuser makes sure that the water flow is evenly distributed over the sand bed and maximizing the filtration process. If you’re a fan of the temporary summer pool, then you will absolutely love the Sand Master. Setting up or constructing a makeshift pool or a kiddy pool during the summer is relatively easy, the hard part lies in keeping it clean. And that is where the Sand Master comes in. The Sand Master is the perfect solution for treating any above ground soft sided pool. As it features a fantastic 20 GPM pump and a 4 position multiport valve and system base, it effortlessly sieves through the most persistent debris particle. And along with its portable design and a 1.25-inch x 7.5-inch hose you can carry it around with you and place it anywhere in your backyard. 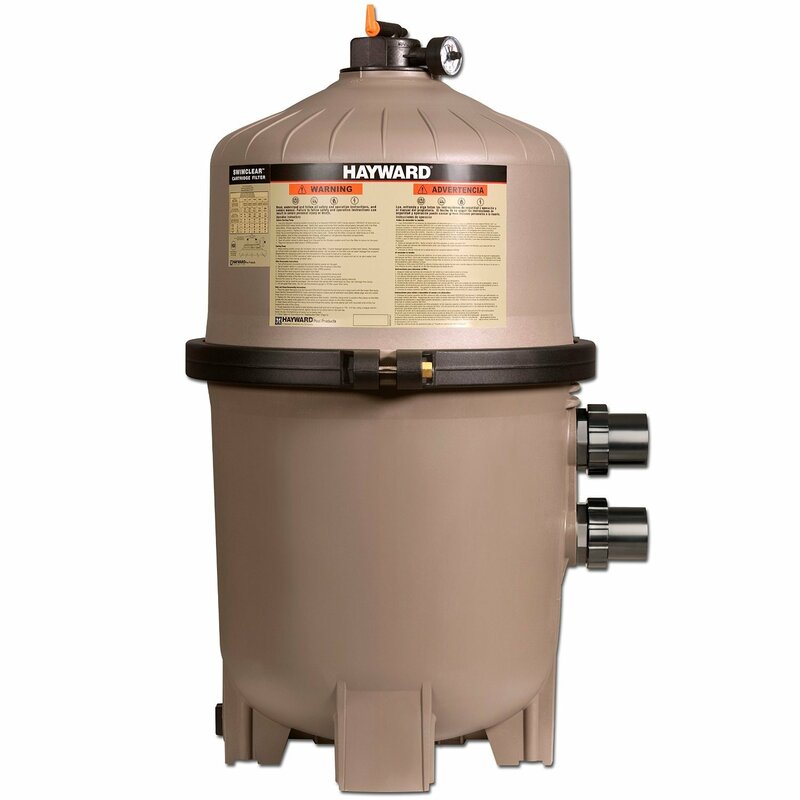 Its 12-inch filter tank is extremely corrosion resistant and holds 42 lbs of sand that dramatically improves the filtration process. 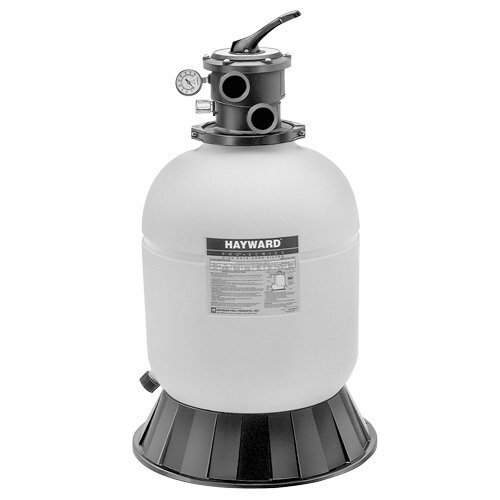 Since its conception 80 years ago, Hayward has symbolized sophistication and reliability in the pool treatment market. And as one of the pioneers of modern-day pool cleaning, they have been helping pool owners with all their maintenance needs. The SwimClear Plus series is the latest addition to their cartridge filter oeuvre, which are perhaps the most advanced pool equipment in that genre. Ranging from 90 square feet to 175 square feet , the SwimClear Plus C1200 variants have 1.5” to 2” pipe sizes that come with a single locking knob, which securely fastens the head to the filter tank. This uni-polar body eliminates the use of bolts or clamps that would have otherwise been at great risk of a leak from corrosion. Additionally, to maintain a maximized water flow the filters even have an extra large cartridge element that have new precision features and an extruded core. This keeps the internal mechanisms durable while giving a well-balanced filtration process. One of the more user-friendly models of Hayward’s SwimClear series. The C030 pleasantly surprised us with its fantastic energy efficient functions that are extremely easy to use and maintain. The SwimClear filters offer a choice of 225, 325, 425, 525 and 700 sq. Ft. of dirt holding capacity, and as the C030 is the smallest model, it is quite ideal for smaller pools and spas. It possesses one of the most durable filter tanks for a cartridge filter, that can withstand the most demanding filtration applications and environmental hazards. Its large cartridge (700 square feet) is very easy to clean and replace. As it eliminates the risk of backwashing, the filter is efficiently able to save up to 2,500 gallons of water. And along with the manifold configurations, it provides one of the most effective hydraulic performances that reduce the overall cost of operations. With customer satisfaction in mind, Intex has gone a step further in making their Krystal Clear Cartridge Filters one of the most accessible water treatment tool in today’s market. Their 28633EG has a unique Hydro Aeration Technology that enhances water circulation and filtration. What makes this so innovative is that during the aeration process it makes the fine particles in the water clump together and settle to the bottom of the pool. And making it much easier to remove the sediments. And by mixing air with water, it oxidizes the iron and manganese in the pool. This not only gives the pool a much-needed sparkle, but increases the number of negative ions at the water surface as well. The negative ions improve the air quality around the pool and keep it fresh for an extended period of time. The 28633EG comes in 3 types, A, B and C where the C type caters to the lowest gallon capacity and lacks a 24-hour timer. As we have already mentioned, D.E is the best when it comes to being the most efficient option of keeping your pool clean, but it’s quite expensive and out of reach for many pool owners. 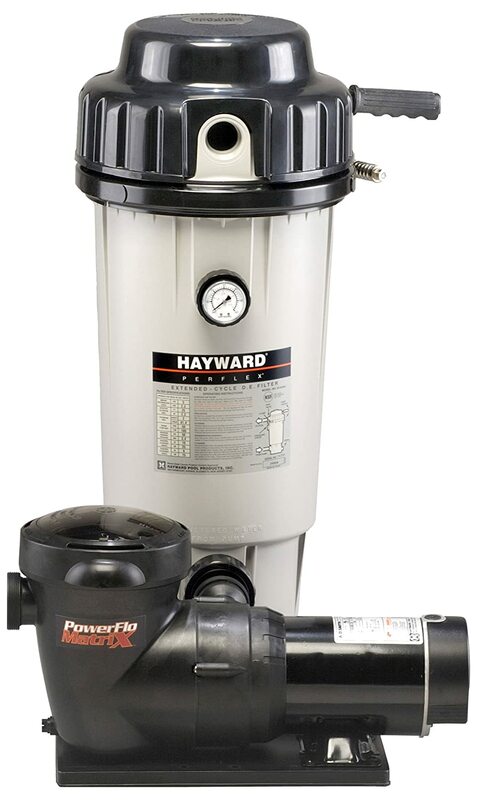 Hayward, on the other hand, tries to solve this issue by creating an entry-level and affordable range of D.E pool filters, and the ProGrid is one such series. The D.E ProSeries comes with an effective filtration areas range of 24 square feet to 72 square feet and a series range of 48-144 GPM public flow rate. Where the DE6020 sits at around 120 GPM, making it ideal for a moderately sized pool. It comes with a high capacity manual air relief valve that releases air much quicker and facilitates a much even and continuous water flow. Additionally, for improved efficiency, it has a high impact grid element that is specially designed for an up-flow filtration and top-down backwashing to maximize filtration speed. 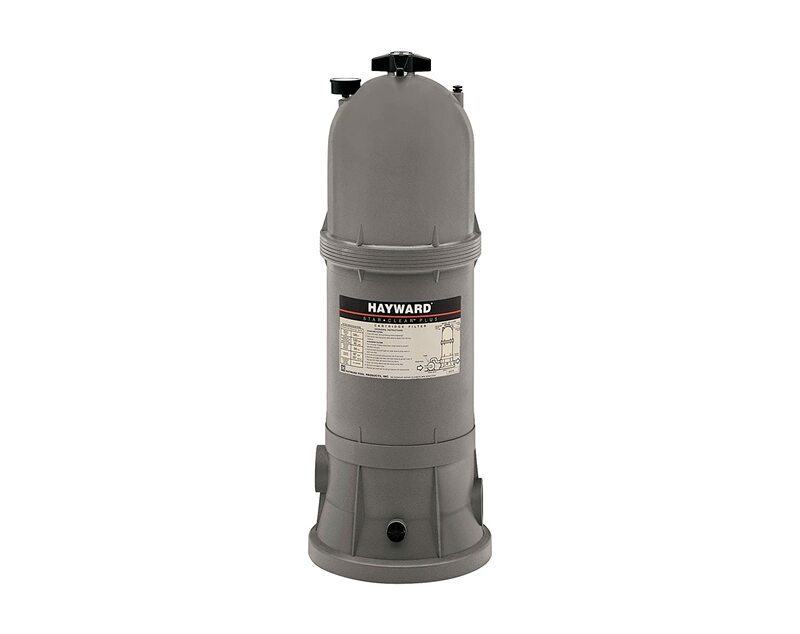 Hayward’s Perflex D.E Filter Systems stole the show when it came to providing us with one of the fastest pool filtration experiences. And what makes them, so amazingly quick is the versatile Plex-Tubes that allows the filters to instantly drain out the dirt and powder for seamless water flow. The EC50C93S has variants of 1 HP and 1.5 HP of Power Flo Lx and Power Flo Matrix pumps, that come with their own exclusive bump handles making them easily accessible for manual control. 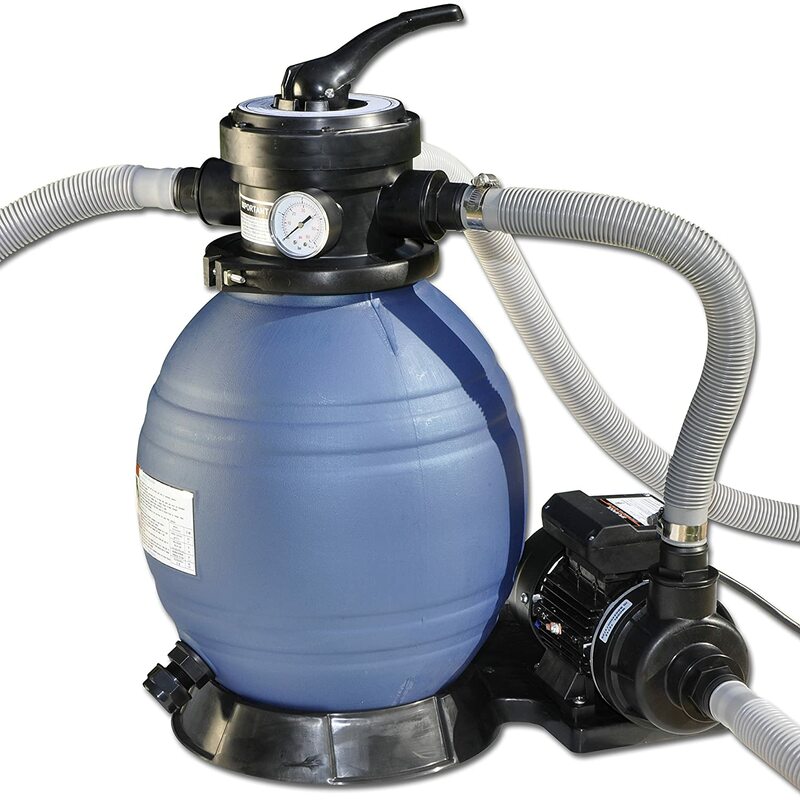 And the more popular 1.5 HP has 2-3 system components and a Power-Flo Matrix, which has a modular platform base that accepts optional chlorine feeders. This special matrix mixes with the diatom powder to create an exceptionally close-knit mesh that sieves out the smallest particles right from the first cycle. It saves a tremendous amount of time and doesn’t make you wait for long before you can enjoy your pool. Unlike the Perflex EC50C93S, the ECAC series are more for the pools that are kept in a very cramped backyard and surrounded by a lot of trees. Their cleaning processes are unparalleled, and by the time you’re done with all the filtration cycles, your pool will be spotless, and it would have never looked cleaner. This fantastic cleaning only comes because of the patented Flex-tube. This tube allows for extended filtration cycles because it uses the D.E filter powder mixed in the water over and over. It even has a unique bump mechanism incorporated into it, which makes them instantly clean themselves and in one single, uniform motion. But even with the extended filtration cycles, all the ECAC models from 40AC to 75AC are much faster in getting your pool clean than the other overpriced filters in the market. And they are more user-friendly as well. High-end pool filtration systems are a more permanent solution of keeping your pool clean, and may not always be the best pool treating option especially for secondary debris particles. In such situations, to minimize a filter’s operational cost you can always choose to go for a more temporary option. Here are a few choices you can opt for. A pre-filter is more like a basket for your skimmer which is constructed like a net. This net is used mainly to catch the bigger debris particles like fallen leaves and accumulated dirt. It is also useful in sieving out bugs that litter the water surface and percolated dust that settles to the pool’s bottom. The pre-filter improves the filtration systems longevity as well, thereby reducing the filters maintenance costs and cleaning. As one of the most basic and entry-level pool cleaning tool, the pre-filter is quite inexpensive and comes within a price range of $3-$30, depending on the size and type of skimmer you have. Another amazing solution for keeping your pool debris free without having to overwork your pool filtration system. The most impressive factor of the automated pool cleaner is how you can use it in conjunction with the filter. Automated pool cleaners come in 3 major categories. Suction cleaners: The cheapest category of automated pool cleaners. The Suction cleaners are pretty easy to use, just hook them to the water filter pump and you’re good to go. They roam about the pool randomly while sucking up debris and come at an affordable price range of $99-$249. Pressure cleaners: A bit more expensive than the suction cleaner, coming at a range of $199-$599. The pressure cleaner has a unique work function as they are powered by the water pressure from the pool return. Their most attractive aspect is the power they boast, and unlike the suction cleaners, they take care of larger and heavier debris particles as well. Robotic cleaners: The most expensive brand starting from $264 and goes as high as $4799. And as the name suggests, these small units come with their own A.I and will scrub your pool tiles along with vacuuming it. Before going for an extra filtration accessory, make sure the brand you pick suits your pools tiles. As some brands are known to suite vinyl 3 and gunite 4 tiles more than others. Choosing the right pool filter may seem like an impossible task at first. But once you get familiar with the type of pool filter you need and pool size and type, the decision making process gets easier. And if you wish to pick one from our list you, then you cannot possibly go wrong.